Temple Grandin has autism and has written a thoughtful description of her experience and how she thinks in Thinking In Pictures and Other Reports From My Life With Autism (Vintage Books: 1995) For Grandin, she literally “sees” the world in her brain. She translates sound and touch into visual brain images. She can view her brain images in 3-D which allows her to develop plans in her head before putting them on paper (Grandin designs live stock handling facilities). So, what does this have to do with mediation? The answer relates to how you think, how the participants in mediation think and how you connect with them. Neurolinguistic Programming (NLP) developed by Richard Bandler and John Grinder models three representational learning/thinking styles – visual, audio and kinesthetic. Visual people use words like see, picture, look, vista, etc. Audio words are hear, sound, clang, etc. Kinesthetic words are feel, touch, grasp. And there are neutral words like consider, think, sense, and understand. We each have a generally preferred style and while we learn/think in most all modes, we have one that is strongest. (Grandin writes that she is purely visual.) For the visual person, you think in pictures and use visual words. The audio person thinks in sounds and uses sound words. Thus, when you put a visual and an audio person together in mediation, they are constantly translating each others words (and maybe your words) into their own representational system. You, as mediator can help translate and you can use words to match people. Or you can use all three. In my opening mediation comments, I usually say something like – “We’re going to take a look at this situation, talk about it and then try to wrap it up.” In this sentence I’ve used words in all three styles. Further, when you match learning styles you build rapport as there is no translation needed. You connect with how people think and so you connect with them. Of course, this is just a tip of the iceberg comment on learning styles and NLP, yet I have found these concepts and tools quite powerful. Next mediation, listen closely to the words used – both yours and the participants. And, if you want to learn more, check out two books - Frogs into Princes by Richard Bandler and John Grinder (this is a transcript of a workshop and very accessible) and I hear what you say, but what are you telling me? The strategic use of nonverbal communication in mediation by Barbara Madonik (this is more technical, but does have some specific mediation related content). Check out these words - inspire, encourage, negotiate, listen, dream, envision, communicate, collaborate, empower. According to a recent publication from the School of Public Heath at the University of North Carolina in Chapel Hill, these are some of the more important characteristics of leaders. The article, "Public Health Leaders" and actually the entire Spring 2008 Carolina Public Health magazine is devoted to leadership in the public health field; however, for me it was the words that got me thinking about our work as mediators. Each time we serve as mediator, we lead a process to explore the resolution of a dispute or conflict. Do we inspire the participants in our mediations? Do we help them dream? Do we help participants empower themselves? The list is long, even longer than the nine words above, and yet I wonder how aware are we as mediators about our role as process leader? Thus, in your next mediation, think about how you lead. Are there areas that need further exploration? Do you need to fine tune your leadership skills? Reconsider your mediation process - is there something that you might do differently? Be aware and in so doing you will be an even stronger leader! The North Carolina Industrial Commission began a mandatory mediation program in 1995. Since then the statistics have been pretty steady with almost 75% of all mediations ending in settlement. The current mediation related issues at the Industrial Commission mostly focus on the enforcement of mediated settlement agreements (msa) and here's a 1st quarter case update for your consideration. The main lesson as mediator is to make sure you have all the required language in the agreement and make sure it is signed! In this case, the parties reached a msa concerning the payment of medical expenses pre 11/16/04 in a pre Hyler claim. The case went to hearing on a claim for additional medical expenses post 11/16/04. At hearing, DC Harris approved the msa and rejected a compromise settlement agreement which included “an overreaching release of all claims . . . [which] might be construed as more expansive than the language in the mediated settlement agreement.” From a practice standpoint, you may want to explore specific release language with counsel at mediation. The parties reached agreement at mediation for the payment of $60,000 plus payment of all related and authorized medical bills. Defendant prepared a clincher; however, claimant declined to sign. At the DC and Full Commission hearing, the Commission considered the testimony of claimant’s former counsel concerning the nature of the settlement and of counsel’s review of the settlement with claimant. This decision is well worth your review as it provides an excellent review of the law around mental capacity, the enforcement of msa’s per Lemly, and the “time” to be used for review as it relates to after acquired information. Branch v Dollar Tree IC 564626 February 2008 The parties reached agreement at mediation and executed a msa. A clincher was subsequently drafted, but claimant refused to sign. Defendant requested a hearing to enforce the msa. At hearing, claimant argued that some of her medical records were missing at the time of mediation; however, DC Ledford found that since claimant did not supply additional records then there were no additional records to review. Further, DC Ledford found that claimant had received extensive medical treatment and review of her condition. DC Ledford held that “[t]here was a meeting of the minds among the parties as to all essential terms of the agreement at the mediated settlement conference held on June 25, 2007, including the payment of medical bills. The terms set forth in the Mediated Settlement Agreement are sufficiently certain and definite, and sufficient to form a binding contract.” DC Ledford also made a number of the standard 97-17 and Rule 502 findings and enforced the msa as fair and in the best interests of all parties. Without reviewing the msa, it is unclear from this decision whether the 97-17 and Rule 502 language was included in the msa or was incorporated by the Deputy holding. While the better practice would be to include the language in the msa, this case suggests that the Commission can also supply the needed language. Mooring v Target Stores IC 002328 January 2008 The parties reached a msa in February 2002 and a clincher was subsequently executed and approved by the IC. Claimant continued with medical treatment, had a back fusion surgery and was found disabled by Social Security. It appears that the decision not to enforce the msa is based primarily on fairness and best interests as opposed to some technical defect of the msa. Whaley v McLamb IC 548959 FC January 2008 The parties did not reach agreement at mediation, but claimant later agreed to a settlement. A clincher was drafted, but claimant declined to execute it. The claim was later denied by DC Holmes who held that no enforceable msa had been reached. On appeal, the FC, Balance, Mavretic and Scott affirmed, also holding that there was no enforceable msa. This is another case that confirms the law in this area – if you want an enforceable msa, get it in writing! What Number is Your Number? The mediation process in litigated cases usually comes down to emotions and money. And usually for the lawyers, claims professionals and even clients involved, the focus quickly shifts to the dollars. So, when we negotiate in mediation, what do the numbers that make up a proposal or counter proposal mean? Does it matter if you go first or should you always try to be second? What happens if one side thinks the first number presented is much too high or too low? These are important questions and during the month of May, I want to address a range of issues as it comes to numbers. Today, I want to tell you about a recent mediation where numbers mean numbers. This was a workers’ compensation case where the employee claimed a knee injury which was denied by the employer. The employee was a paramedic. During mediation, after some initial discussion about the case in general session, we met in private caucus to further discuss the case and then claimant made a demand for settlement. Proposals were exchanged and the negotiation moved forward. The negotiation continued and upon entering one of the caucus rooms something about acronyms came up and on the next proposal, claimant moved to a figure and called it a “1017” number. In emergency medical speak, “1017” refers to being en route to a destination. For the claimant, they were saying – “We’re getting there, but we’re not there yet.” The response from the employer, which included the employee’s supervisor, was a counter proposal as a “1023” number. Saying “1023” means that you have arrived on the scene or in mediation terms, we are at our number. Using this jargon shifted the mood of the discussion, seemed to lighten each room and while the 1023 number turned out to still be a 1017, the next number was the 1023 and the case settled. So, what number is your number? Mediation Humor - To Laugh or Not to Laugh ? Mediation can be a very stressful place for all participants - even the mediator! So, what can you do about it? Can you crack a joke as mediator? Can you laugh with participants or do you need to stay "above it all" as the mediator? As with most all mediation tolls and techniques, there are pros and cons to each. The same is true for humor. On a serious note, you must use humor with care and careful consideration. The joke you tell one group may not work with another and your timing must be impeccable. If you have ever tried something that was funny to you, but fell flat, then you know what I mean. It’s not the end of the world, but you sure feel bad given the looks you get. I suggest that you do not start off with “funny” comments or a joke and save this tool for a later moment after you have built rapport and can gauge your audience. I sometimes bring in what I call “conflict comics” that provide a laugh. 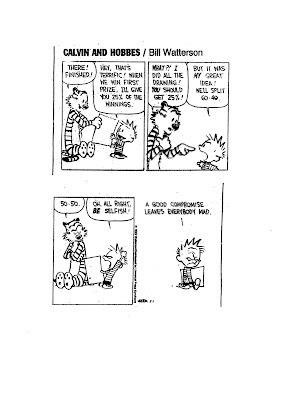 One of my favorites is a Calvin and Hobbs on compromise (see above). I show this to folks and tell them that I’m trying to make everyone look like Calvin. I call this the “Calvin Effect” and we all laugh. Folks resonate with Calvin and the notion that compromise might be necessary and this helps them let out some tension and then consider how to proceed. How about you? Please pass on your favorite mediation humor stories with a comment!